The saying, “If you don’t have your health, you have nothing,” is true for every person of every age in every country on earth. It’s easy to get sidetracked into believing work or your relationships are the most important things, but when a serious health issue creeps in, you quickly realize that nothing else matters. Even something relatively minor like a misaligned disc in your cervical spine can cause headaches that will have you on your back in a darkened room. 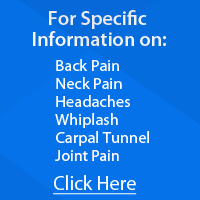 Here is some valuable health advice from a Dickinson chiropractor that will help you to live a pain-free, disease-free life. Movement is one of the key factors to keeping your body strong and flexible. It can also help to release chemicals in your brain that make you feel good. You don’t have to go to the gym and you don’t have to play an organized sport, but you should engage in some sort of physical activity every day. An exercise plan or recommendation is part of any health advice you’d receive from a Dickinson chiropractors. For most people the road to total health isn’t starting with a perfectly clean slate. You’ve already suffered injuries or had health issues that require some attention. When you visit our Dickinson chiropractic team you’ll be assessed and a treatment plan will be created that will likely include chiropractic adjustments and other techniques. Relieving tension in your joints and spinal column can provide tremendous benefits by eliminating pain and allowing blood to flow freely. Chiropractic treatment is a valuable first step on the road to a healthy life. At Neck & Back Pain Treatment Center our team is here to help answer your questions. Please feel free to contact us today.